The closing of the Bomber means that there is now a lack of space for undergrad students; however, the Grad House can be a viable option for those looking for a space on campus. The Grad House is predominantly meant as a social space for graduate students, offering a calm environment to relax, eat, and drink after a long week of hard work. It is currently the only designated space for graduate students, but undergrads are welcome as well. The Grad House is prepared to receive a larger influx of traffic, in their welcoming of all undergrads.However, it is a licensed establishment so any students visiting the Grad House for an alcoholic beverage must be 19 or older. Undergrads are also not able to access the discounted pricing afforded to grad students who have paid the Grad House fee. The Graduate Student Association is ensuring that the extra traffic does not prevent Grad students from using the space. 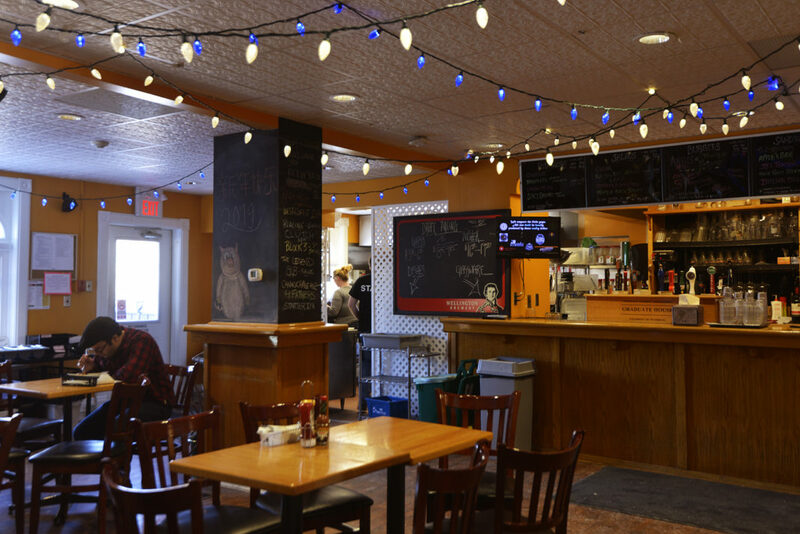 The Grad House provides locally sourced, quality food and beverages with 15 draft taps of locally produced craft beers and ciders. Food is made in-house as much as possible, from the salad dressings to the 100 per cent beef burgers. Their chicken is hand-cut halal from Sargent farms in Milton, and their tempeh comes from Henry’s Tempeh in Kitchener. Even more exciting, a new menu has just been launched this past month featuring new vegan and vegetarian options, and Fair Trade coffees and teas. Their chili, a popular staple, is vegan, delicious and hearty. It’s packed with chick peas and beans with a smooth blend of spices and served with crispy corn chips. It is the perfect meal for a cold winter day. Their chip and dip has crispy and salty corn chips, with hummus and made-in-house salsa. It makes a great light and refreshing snack. Their tempeh sandwich served with specialty home fries is a vegan textural delight where sweet soy tempeh meets crunchy, acidic slaw in a toasty bun. The home fries are a crispy golden brown with a hint of rosemary. The cool sandwich and the warm home fries beautifully compliment each other. Despite rumors, the Grad House does not prepare their high-quality food using a microwave, as that would drastically diminish its quality. On top of all this amazing food, the Grad House also hosts weekly events that mostly cater to grad students, but can, of course, be enjoyed by all. Trivia and open mic nights happen every other week, and this term, the Friday concert series highlighting local bands and musicians are happening twice per month. There are also board games in-house for anyone to use anytime they visit the Grad House. Additionally, wine/beer tastings and Writer’s Whimsy events happen less often. You can find out about what is going on at the Grad House anytime by checking out their social media pages.